The earliest civilized governments were essentially priestly governments. It was not kings and captains who first set men to the plough and a settled life. It was the ideas of the gods and plenty, working with the acquiescence of common men. 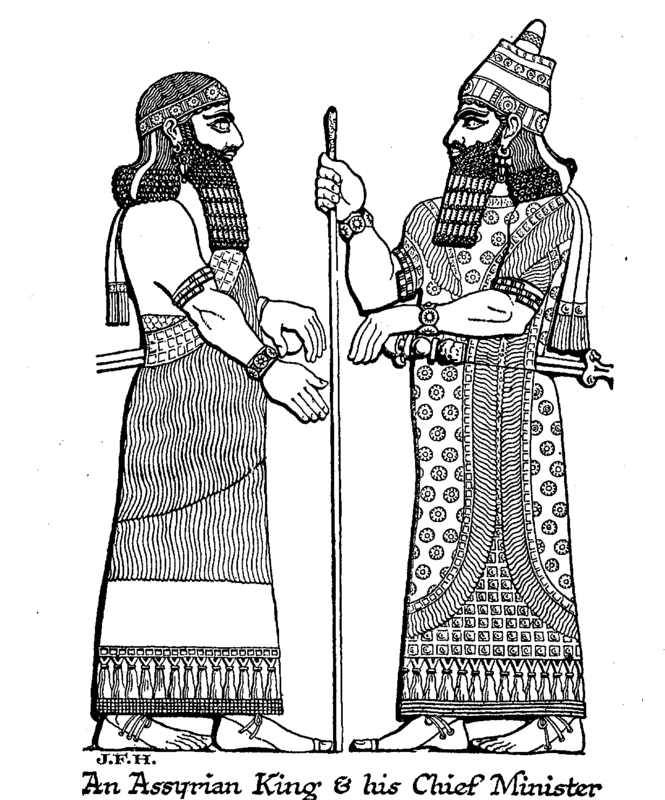 The early rulers of Sumer we know were all priests, kings only because they were chief priests. And priestly government had its own weaknesses as well as its peculiar deep-rooted strength. The power of a priesthood is a power over their own people alone. It is a subjugation through mysterious fears and hopes. The priesthood can gather its people together for war, but its traditionalism and all its methods unfit it for military control. Against the enemy without, a priest-led people is feeble. Moreover, a priest is a man vowed, trained, and consecrated, a man belonging to a special corps, and necessarily with an intense esprit de corps. He has given up his life to his temple and his god. This is a very excellent thing for the internal vigour of his own priesthood, his own temple. He lives or dies for the honour of his particular god. But in the next town or village is another temple with another god. It is his constant preoccupation to keep his people from that god. Religious cults and priesthoods are sectarian by nature; they will convert, they will overcome, but they will never coalesce. Our first perceptions of events in Sumer, in the dim uncertain light before history began, is of priests and gods in conflict; until the Sumerians were conquered by the Semites they were never united; and the same incurable conflict of priesthoods scars all the temple ruins of Egypt. It was impossible that it could have been otherwise, having regard to the elements out of which religion arose. It was out of those two main weaknesses of all priesthoods, namely, the incapacity for efficient military leadership and their inevitable jealousy of all other religious cults, that the power of secular kingship arose. The foreign enemy either prevailed and set up a king over the people, or the priesthoods who would not give way to each other set up a common fighting captain, who retained more or less power in peace time. This secular king developed a group of officials about him and began, in relation to military organization, to take a share in the priestly administration of the people’s affairs. So, growing out of priestcraft and beside the priest, the king, the protagonist of the priest, appears upon the stage of human history, and a very large amount of the subsequent experiences of mankind is only to be understood as an elaboration, complication, and distortion of the struggle, unconscious or deliberate, between these two systems of human control, the temple and the palace. And it was in the original centres of civilization that this antagonism was most completely developed. The barbaric Aryan peoples, who became ultimately the masters of all the ancient civilizations of the Orient and of the western world, never passed through a phase of temple rule on their way to civilization; they came to civilization late; they found that drama already half-played. They took over the ideas of both temple and kingship, when those ideas were already elaborately developed, from the more civilized Hamitic or Semitic people they conquered. The greater importance of the gods and the priests in the earlier history of the Mesopotamian civilization is very apparent, but gradually the palace won its way until it was at last in a position to struggle definitely for the supreme power. At first, in the story, the palace is ignorant and friendless in the face of the temple; the priests alone read, the priests alone know the people are afraid of them. But in the dissensions of the various cults comes the opportunity of the palace. From other cities, from among captives, from defeated or suppressed religious cults, the palace gets men who also can read and who can do magic things. The court also becomes a centre of writing and record; the king thinks for himself and becomes politic. Traders and foreigners drift to the court, and if the king has not the full records and the finished scholarship of the priests, he has a wider and fresher first- hand knowledge of many things. The priest comes into the temple when he is very young; he passes many years as a neophyte; the path of learning the clumsy letters of primitive times is slow and toilsome; he becomes erudite and prejudiced rather than a man of the world. Some of the more active-minded young priests may even cast envious eyes at the king’s service. There are many complications and variations in this ages-long drama of the struggle going on beneath the outward conflicts of priest and king, between the made man and the born man, between learning and originality, between established knowledge and settled usage on the one hand, and creative will and imagination on the other. It is not always, as we shall find later, the priest who is the conservative and unimaginative antagonist. Sometimes a king struggles against narrow and obstructive priesthoods; sometimes priesthoods uphold the standards of civilization against savage, egotistical, or reactionary kings. One or two outstanding facts and incidents of the early stages of this fundamental struggle in political affairs are all that we can note here between 4,000 B.C. and the days of Alexander. Cp. Moses and the Egyptian Magicians.